In early 1995, members of the Columbus Medical Association came together to discuss the increasing numbers of central Ohio youth dying from preventable traumatic injuries. The Regionalized Trauma System Task Force was established, comprised of eleven local physician and nurse trauma care leaders. Their mission was to explore possible solutions to increase victim survival after a critical trauma event in central Ohio and to address public injury prevention education. In 1997, the group was renamed the Franklin County Trauma Committee after seeking participation and collaboration from all local hospitals and Emergency Medical Services (EMS) agencies. However, trauma surpassed the Franklin County metropolis as hospitals and EMS providers from contiguous counties were increasingly utilizing Columbus trauma centers to care for their critically injured patients. In 1997, the name was changed to the Central Ohio Trauma System (COTS) Foundation and it was incorporated. The Board of Trustees was seated including representatives from hospitals, EMS agencies, local government, public injury prevention programs, and the Columbus Medical Association. In 1998, the Central Ohio Trauma System Foundation was officially established as a 501(c)(3) non-profit status and hired its first employees. In 1999 the “Foundation” designation was found to be misrepresentative of COTS’ mission and goals in the community. The term “Foundation” was legally deleted by formal trade name registration with the Ohio Secretary of State and the current name of Central Ohio Trauma System, or COTS, was identified. 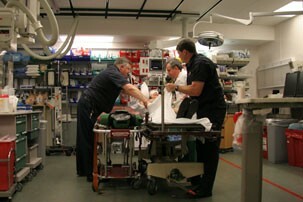 The initial work of COTS included establishing the COTS Regional Trauma Registry, convening stakeholder groups to determine local trauma care issues, and teaching stakeholders about the importance of “getting the right (trauma) patient to the right hospital in the right amount of time.” Trauma stakeholders were not familiar with COTS and did not know the value of a regional trauma system. Originally, only hospitals, EMS, and public health within Franklin County were involved with COTS, but it did not take long for contiguous and non-contiguous counties to participate once they recognized the benefits of regional collaboration. The Central Ohio Trauma System has grown from serving stakeholders in one county to serving stakeholders in twenty Central Ohio counties. Over the years, COTS has expanded its focus from trauma to emergency medical care issues including but not limited to emergency department diversion, patients experiencing a sudden cardiac event or a stroke, and transportation of patients with concealed carry weapons. In 2002, COTS took on the role of coordinating disaster preparedness for the region’s hospitals and other health care systems. Today, COTS is a significant force in the Central Ohio community around issues of trauma, emergency services, and emergency preparedness. The Central Ohio Trauma System is THE organization where patient care issues affecting more than one stakeholder group can be brought and addressed in a neutral forum. It is the one place in Central Ohio where no matter which stakeholder groups are involved in addressing the issue, the PATIENT is always at the center of decisions being made. The work done by the COTS stakeholders ultimately benefits the patient even though no direct patient care services are provided through COTS. The success of COTS is due to the tireless dedication of many stakeholders---physicians, nurses, EMS providers, public health experts, emergency response personnel, registrars, program coordinators, administrators, and countless others. Without these unsung heroes, a regionalized system of care could not be possible.